Retained surgical items (RSIs) are much dreaded, preventable complications associated with surgical and other invasive procedures. Despite much effort going into eliminating these “never events” and the associated heavy burden for patients, providers, and institutions, RSIs continue to occur. This manuscript reviews fundamental concepts related to RSI, including risk factors, prevention strategies, technology-assisted detection, team strategies, and pertinent safety education. In addition, we performed a secondary review of a database of all published case reports and series of RSI between 1909 and 2015, focusing on clinical presentation, symptomatology, morbidity, diagnostic workup, pathology findings, and temporal characteristics. Despite a vast body of knowledge regarding RSIs, more needs to be done to help further reduce and prevent these occurrences. From the natural history standpoint, majority of RSIs are either immediately “intercepted” or patients develop acute symptoms requiring emergent surgical removal. However, a substantial proportion of RSIs may go unnoticed for long periods of time, only to emerge much later as either incidental findings or masquerade as other entities (e.g., tumors or abscesses), thereby posing a diagnostic challenge when they present. Symptoms and signs associated with RSI's are often vague and most often associated with the anatomic location of the retained item., A study tracking outcomes in over 1100 RSIs events found associations with significant mortality (4.5% cases), permanent (16.3%), or temporary (78.1%) physical injury, as well as psychological sequelae (1.1%). The intent of this manuscript is to provide the reader with a comprehensive overview of up-to-date evidence on RSIs, their natural history, preventive strategies, and a discussion of related topics. Among the latter, the authors discuss clinical presentations, imaging and pathologic characteristics, as well as medicolegal implications and economic impact of RSI. Finally, a collected review of 281 reported RSI cases is provided, focusing on clinical presentation, morbidity, surgical characteristics, and other clinical parameters. A comprehensive search of world literature was performed using Google™ Scholar, EBSCO, and PubMed. The terms searched for included the following terms used alone or in combination: “RSI,” “retained surgical instrument,” “foreign object,” “gossypiboma,” “never event,” “retained surgical foreign bodies (RSFBs),” “laparoscopic,” and “endoscopic.” Cross-referenced sources were subsequently tabulated from primary sources and selected based on content merit. Most current and relevant articles were subsequently selected, reviewed, and included in this manuscript. In addition, a dataset of 281 RSI cases between 1909 and 2015, collected by our study group and previously published in an open access forum, was analyzed for key demographics, item types and locations, clinical and pathologic findings, time to RSI identification/removal, as well as surgical procedure types, and case specialty designations. Descriptive results of subsequent analyses were tabulated and graphically displayed (for details, see section titled “review of collected RSI case reports and series” below). The definition of an RSI is commonly extrapolated from the National Quality Forum's definition, which characterizes RSI as a foreign object that is unintentionally retained within a patient following surgical or other invasive procedure(s), including object(s) deliberately placed by the provider, but subsequently unintentionally left within the patient. It is important to note that the most commonly agreed upon definition of what temporal marker constitutes “final closure” for the purposes of triggering an “RSI event” is the completion of surgical “skin closure.” However, this may need to be modified to reflect “the last step” of the surgical closure process. For example, an operation that conclusively ends with a definitive fascia-only closure (e.g., not a temporary closure) and no formal skin closure is performed (e.g., due to the presence of active infection) should be considered as being “completed” upon the formal closure of the most superficial layer. Although any surgical tool can potentially be “forgotten” within a patient, the most common type of RSI is the surgical sponge (followed by other “textile” items).,, Masses formed due to retained textile products are referred to in the literature as gossypibomas (from “gossypium,” Latin term meaning the genus of cotton plants and “boma,” a Swahili term denoting “place of concealment”), gauzoma, and muslinoma (from muslin, a woven cotton textile)., 8, ,,, The term textiloma can refer to a mass caused by any textile material (including hemostatic gauze).,,, Masses caused by RSIs have also been referred to as “pseudotumors” and “foreign body reactions.”, 8, ,, Finally, some authors have advocated the definitional separation between textile and nontextile RSI. Such distinction may indeed be important due to the fact that current technology-based preventive measures focus predominantly on tracking textile objects, thus altering the overall “retention risk profile” by object type and causing a shift in proportional incidence of items from “textile” to “nontextile” as a result. It is inherently difficult to study the natural history of RSIs because these events are both rare and underreported., By pooling cases of RSIs, several groups of researchers have attempted to better define specific risk factors for these events, as well as the associated clinical manifestations.,,,, One retrospective study reviewed 54 RSI cases identified via claims/incident reports between 1985 and 2001. The authors compared RSI cases with controls that underwent similar procedures in order to identify risk factors for retained items. The risk of RSI was elevated in the setting of emergent surgeries, unplanned procedural changes, and increasing patient body-mass index (BMI). In another case–control study, Lincourt et al. reviewed 30 RSIs and found that independent risk predictors included “more than 1 procedure” performed during the same operative session and an incorrect sponge count. Finally, the largest study in this category included 59 RSI's in a multicenter case-match design, and found independent risk factors to include longer duration of surgery, the presence of safety variances, and incorrect surgical counts. Interestingly, the latter study found a possible “protective effect” of surgical trainee presence  although this finding has not yet been validated independently. In 2014, Moffatt-Bruce et al. 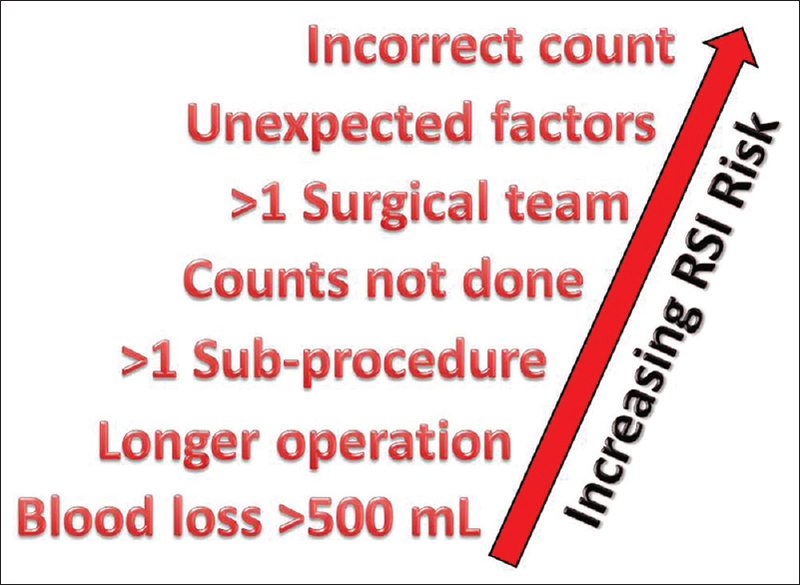 published a meta-analytic study involving the three source manuscripts presented above, finding that the risk for RSIs may increase when intraoperative blood loss exceeds 500 mL, an incorrect surgical count is present at any point during the procedure, the surgical count is omitted, more than one procedure is performed during the same operative session, or there is an occurrence of unexpected intraoperative factor or factor(s) [Table 1]. The authors also found an additional association between RSI risk and increasing duration of operation. The pooled data also indicated that BMI, emergent procedures, changes in staff, “after hours” operations, and the presence of a surgical trainee did not affect the overall risk. The authors also proposed a risk stratification scheme that was based on pooled data from the above source studies [Figure 1], providing a foundation for future research in this area. Patients who have experienced RSI and associated complications may present in a variety of ways. Clinical complaints often include abdominal pain, abscesses, nausea and/or vomiting, wound complication, and the finding of a mass while many patients remain completely asymptomatic. Presenting signs and symptoms appear to be significantly correlated with the specific body compartment in which the retained item is located, thus anatomic characteristics must be considered., Finally, one should not discount the possibility of an RSI in cases of atypical “masses” or other delayed presentations of the retained item, even if clinical signs or symptoms appear years or decades after the index operation., For more information regarding clinical presentation, signs, symptoms, procedural characteristics, imaging, and other factors associated with RSI, the reader is referred to subsequent sections of this manuscript. Several imaging modalities can be used to help diagnose RSIs. Prompt and accurate identification of RSI is important in reducing associated morbidity and facilitating both primary prevention and postretention object identification (e.g., verifying that a mass is a retained sponge and not a malignancy). Some institutions have gone as far as the performance of routine high-resolution radiographs of the surgical field in cases that involve a body cavity. More specifically, patients are taken to a dedicated radiography suite following the departure from the operating room, and prior to arrival in the postoperative recovery area. If RSI(s) is/are identified on such imaging, the patient can be immediately taken back to the operating room a nd the object is retrieved without delays – A process important to reducing any subsequent RSI-related morbidity. Ultrasound may be useful in RSI detection and is commonly used when the pathologic abnormality being assessed is in an anatomic location in which ultrasound is customarily considered to be a primary diagnostic tool such as the breast, neck, pelvis, and right upper quadrant, but also in other areas of the body.,,,, Sonographically, a retained sponge will typically appear as “hyperechoic mass” with an intense acoustic shadow., Although ultrasound may be useful in identification of RSIs, it should not be considered as a primary or definitive diagnostic modality., Finally, one must remember that advanced clinical ultrasound applications require significant operator skills and expert interpretation. On magnetic resonance imaging (MRI), the typical appearance of a retained surgical sponge consists of a soft-tissue density mass with a thick, well-defined capsule and a whorled pattern on T2 imaging. Kim et al. described MRI findings of 4 patients with abdominopelvic gossypibomas. Their conclusions support a more standardized description of textile RSI characteristics, especially since MRI is commonly used to image the central nervous system, where such knowledge might have greatest impact., Because of inherent image complexity and the fact that MRI is not the first line imaging modality in the setting of suspected RSI, a certain degree of expertise is needed when interpreting MRI images of possible retained sponges and other objects. Finally, one must remember that the performance of MRI in the setting of metallic RSIs may result in serious complications. Consequently, it may be prudent to verify “absence of metallic object(s)” via plain radiography before proceeding with MRI studies in the setting of suspected RSI. Computed tomography (CT) is considered to be the confirmatory imaging technique for the diagnosis of RSI, especially when retention is chronic and/or there is diagnostic uncertainty., The “classic” presentation of a retained sponge on CT is a well-circumscribed cystic mass with a whorled, spongiform pattern. One may also see “bubbles” on CT because air/gas can become trapped within the sponge fibers., CT is also useful in detection of nontextile (e.g., plastic or metallic) retained items., At the same time, CT imaging may be misleading under certain circumstances and, thus, lead to erroneous diagnosis. This may be in part due to RSIs being low on the differential diagnosis list in vast majority of CT imaging cases. Examples of “incorrect” preoperative diagnoses of RSIs include gastrointestinal (GI) stromal tumor, intrahepatic cholangiocarcinoma, recurrent aspergilloma, and recurrent hydatid cyst. Conversely, a case of an anastomotic “stapler line” mistaken for an RSI has also been reported. Radiologist experience is an important aspect of ensuring that rates of radiographic detection and accuracy of imaging interpretation in cases involving actual or suspected RSIs are sufficiently high. After all, the presence of a reliable “safety net” of radiographic detection of RSIs in instances where multiple risk factors for item retention coexist, or when surgical counts are absent or incorrect, constitutes an important component of the “safe surgery” paradigm. At academic institutions, inexperienced radiology trainees are often responsible for the initial interpretation of radiographic images, resulting in a small number of “missed” RSI cases. Consequently, some hospitals have implemented mandatory attending radiologist review for any films labeled as “potential RSI,” with subsequent attending radiologist to attending surgeon direct communication.,, Finally, modules to help train radiology residents in identifying RSIs on imaging are currently being implemented. Pathology findings associated with RSIs constitute an amalgam of “foreign object confirmations,” inflammatory changes, and findings specific to RSI-related sequelae. One study found that the most common pathologies associated with RSI cases to be localized tissue fibrosis, exudative reaction, purulence/abscess, and other inflammatory changes. The same research group also found that the overall proportion of inflammatory changes increases as the length of time that the item is retained increases. More specifically, pathology findings of RSI cases demonstrated a greater proportion of “inflammation-specific” findings with increasing retained object dwelling time (e.g. 16% specimens with “inflammation” in the group with prompt retrieval, 42% and 50% “inflammation” findings in the intermediate groups, and 68% in the more chronic group). Because of their proinflammatory characteristics, RSIs can contribute to significant morbidity and mortality. Gawande et al. reported that of 54 patients with RSIs, 1 (2%) died, 32 (59%) required readmission or a prolonged hospital stay, 23 (43%) experienced infection/sepsis, 37 (69%) underwent reoperation, 8 (15%) developed a fistula or bowel obstruction, and 4 (7%) had hollow viscus perforation. Others also found significant morbidity and mortality directly and indirectly attributable to RSIs., In a study by Stawicki et al., RSI-attributable mortality was 1/71 (1.4%), readmission rate was about 41%, and nearly 17% of cases presented to institutions that did not perform the index procedure(s). Although larger studies are needed to help quantify the true extent of harm associated with RSIs, it is clear that any complication or mortality attributable to these theoretically completely preventable events is “too much.” Other than immediate identification and retrieval, there are no known methods of preventing the more severe longer-term sequelae of RSIs. Checklists are valuable but also have important limitations pertaining to design, implementation, as well as the human component (e.g., training and active use) of these preventive tools., Evidence is emerging that the implementation of checklists in the operating theater is both constructive and nondisruptive., However, it is also important to note that checklists may realistically compete with other operating room priorities. Moreover, operative patient safety cannot be viewed as a singular item, but rather as a process that spans from the preoperative appointment and evaluation to the postoperative office visit(s). 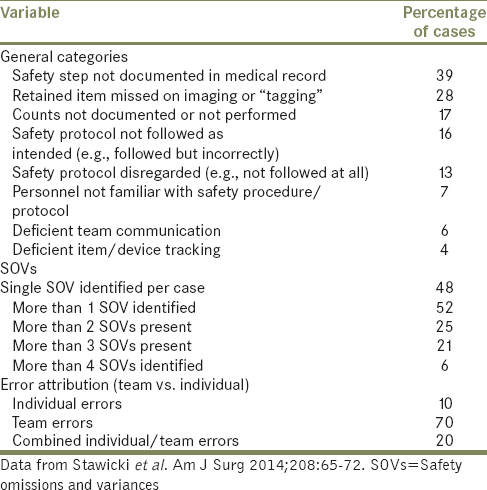 It is important to remember that patient safety and RSI prevention cannot be effectively implemented without effective communication and team training., In fact, team errors (as opposed to individual errors) were present in > 70% of RSI cases in one study [Table 2]. As mentioned throughout this manuscript, more recent developments in this area include the emergence of various forms of “tagging,” implemented with the intent of reducing, and perhaps even eliminating, RSIs. Although there is evidence to suggest that certain types of RSIs can be virtually eliminated with the proper application/use of such tagging techniques,,, there is also evidence showing that RSI may continue to occur despite the implementation of tagging systems at healthcare institutions. In addition, the introduction of tagging systems into the already complex healthcare systems often results in substantial additional costs, and unless the baseline incidence of RSIs is sufficiently high, there is little to no economic incentive for institutions to alter their patient safety systems simply to introduce a new, expensive piece of technology. 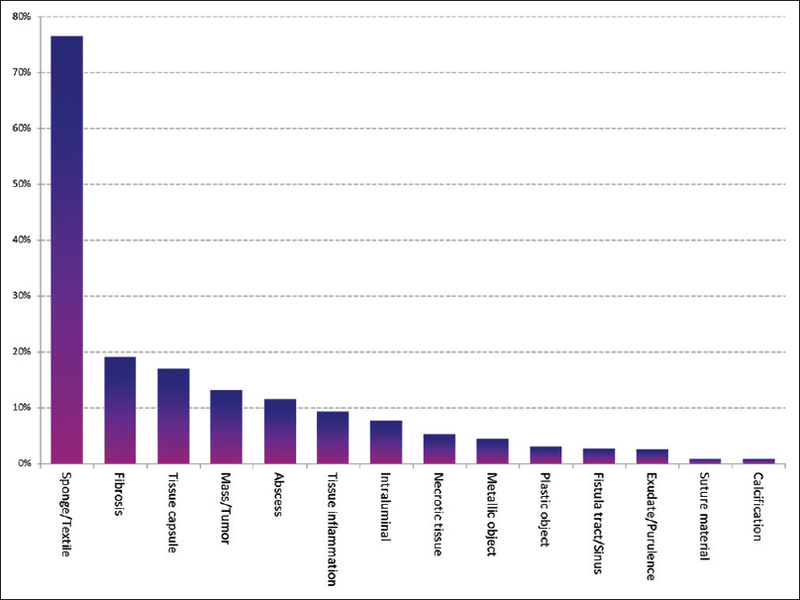 Another point of controversy is the choice of tagging/tracking platform and the potential for discontinuation of related product(s) or product line(s) as competition within this limited market niche increases and companies consolidate their product offerings,, leading institutions to carefully reevaluate their investment in such a capital-intensive proposition. Finally, until a universal system is developed that counts all types of surgical items (e.g. sponges, instruments, and miscellaneous objects), there will always be the risk of unintentional retention of a “different type” of item. Anatomic location of RSI may influence both symptomatology and acuity of clinical presentation. In fact, the anatomical location influences numerous aspects of subsequent care, including clinical work up, the differential diagnosis, the choice imaging studies, as well as any potential morbidity and mortality., The overall clinical picture largely depends on what is retained, where it is retained, and how long it has been retained., The subsequent discussion will review our current knowledge of RSIs found in the abdomen, pelvis, retroperitoneum, thorax, breast and subcutaneous tissues, extremities, head, neck, and the intravascular compartment. Urological complications of RSIs have been described in various case reports., One report presented two cases of gossypiboma associated with urethral stricture following urologic surgery. In another case, a patient presented to the hospital with recurrent lower urinary symptoms a few weeks after an abdominal hysterectomy. She was found to have retention of a surgical hemostat and a sponge, leading to the development of a fistulous tract between the ileum and the dome of the bladder, resulting in fecaluria and the reported acute clinical presentation. Retained surgical sponges may also be found in various retroperitoneal locations as was the case when a surgical sponge was left after a partial nephrectomy, found later on CT during a work-up for bladder outlet obstruction. Damage control (DC) surgeries have contributed to improved survival in trauma patients. One strategy in DC surgery is to preform aggressive hemostatic maneuvers (including intentional hemostatic packing using surgical sponges) followed by serial laparotomies for definitive hemostasis, repair of injuries, washout(s), and removal of any surgical objects intentionally used for hemostasis during earlier operation(s). However, if surgical hemostatic sponges are left in the abdomen for >4 days, the risk of infection and abscess may be increased. 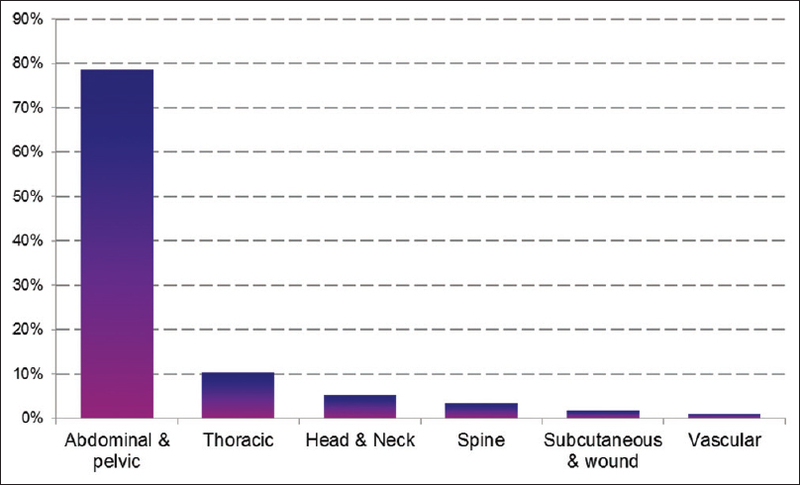 In addition, hemostatic sponges are placed under emergent conditions, and it is highly likely that different surgical teams may be involved in the initial and subsequent operative care episodes., These conditions place patients at risk for RSIs; however, the reported incidence of RSIs in patients who underwent trauma laparotomy continues to be very low (e.g., overall incidence well under 1%). RSIs should be considered on the differential diagnosis for any patient presenting with an “atypical” abodominal, pelvic, or retroperitoneal mass and previous history of previous surgery involving corresponding anatomic location(s). To help assist with more accurate diagnosis and avoid misdiagnosis, efforts are focusing on better detection and identification of RSIs through imaging. Shaish et al. presented imaging findings from various RSIs, including surgical items left in place both intentionally and unintentionally, as well as normal findings that may appear similar to RSIs. Such resources provide significant value to radiologists (and other clinicians) who most likely see RSIs very rarely, yet cannot afford to “miss” these critical findings. Along the same lines, O'Connor et al. outline key imaging characteristics of abdominal and pelvic RSIs. Intrathoracic RSIs are well-described in the literature, accounting for 7–8% of RSI cases in two large series., Thoracic RSIs have been reported following a broad range of procedures including CABG, thoracotomy, cardiac valve replacement, and bilobectomy. Presenting symptoms of thoracic RSIs, especially if adjacent to the lung, may include dyspnea, cough with sputum production, and respiratory distress.,, At the same time, some cases may be completely asymptomatic., CT of a retained intrathoracic sponge will likely detect the radiopaque marker embedded into the sponge. In addition, a retained sponge may produce a “whorled” pattern on CT, similar to similar finding in the abdomen. Surgical sponges left behind in the thoracic cavity have been misdiagnosed as aspergillomas and malignancies., Cardiothoracic cases may be complicated by surgical item retention in the pericardium and may be associated with potentially life-threatening sequelae. Breast surgery is an area of special consideration because of the large volume of operations performed to treat benign and malignant pathologic conditions, as well as esthetic procedures., In addition, RSIs in this general anatomic location may mimic a neoplasm, abscess, or hematoma on both clinical exam and imaging. Ultrasound of retained sponges may show nonspecific cystic, hypoechoic, and complex masses. Contrast-enhanced CT may demonstrate a ring enhancing round mass while MRI may show a “wavy,” low-intensity T1 signal and high intensity signal on T2-weighted images. Consequently, in a patient with a history of breast surgery, if the above described features are found on imaging, a retained sponge should be considered in the differential diagnosis. Numerous literature sources report on various types of surgical items retained in the extremities.,, Extremity RSIs constitute approximately 8% of all cases of unintentional surgical item retention. In one case report, a young man presented with a right lower extremity mass. Five years prior to presentation, he had undergone an anterior cruciate ligament repair for an avulsion fracture. Imaging studies revealed an unusual soft tissue tumor and surgery ultimately demonstrated a well-encapsulated brownish soft tissue mass. Final pathology showed gauze fibers with granulomatous inflammation. Many of the chronic extremity RSI cases follow a similar pattern where the presentation involves a mass suspicious for a sarcoma or other type of malignancy. Imaging can be helpful in clarifying the diagnosis of extremity RSI, provided that the possibility of retained surgical object is on the differential list. 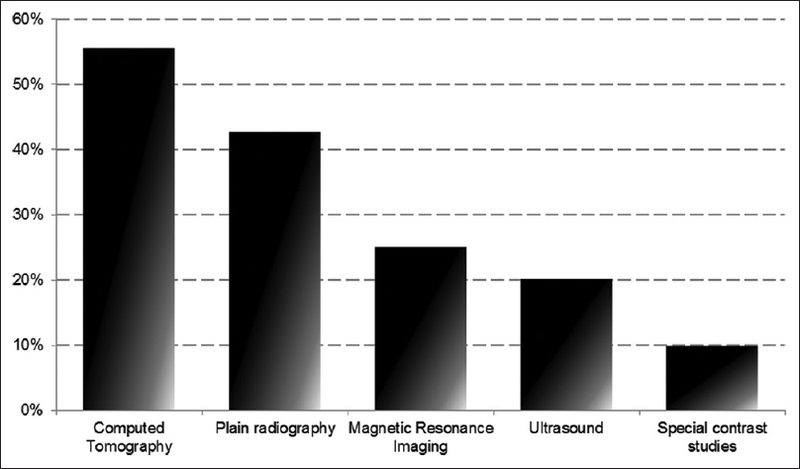 Radiography is useful to detect radiopaque markers characteristic of most textile items used in surgery. Ultrasound may reveal hyperechoic stripes with acoustic shadowing secondary to the presence of gauze fibers. MRI is frequently obtained to evaluate for a suspected “soft tissue mass.” The MRI signal intensity of a gossypiboma can vary based on the fluid content, composition, and stage of tumor. Surgical exploration is often required, however, to make the final diagnosis of a retained surgical body. Pathologic findings consistent with foreign body include giant cells infiltration and surrounding gauze fibers. In addition to strictly (and critically) following established safety protocols and checklists, liberal use of plain radiography in the operating room is recommended to ensure that no foreign objects are left behind, particularly in cases where the sponge count is in doubt (e.g., has not been performed due to emergency, has been repeated due to discrepancies, or was persistently incorrect). There are relatively few cases of RSIs involving the head and neck region. This may be a reflection of relatively smaller surgical field dimensions in head and neck cases, as well as a more limited instrument set used in these more highly specialized operations. Symptoms in the anatomic areas involved are heavily dependent on the location of the RSI in relation to surrounding structures (e.g., proximity to important neurologic, vascular, or aero-digestive structures may result in presentation related to each respective anatomic consideration). The types (and distribution) of retained objects may also differ from other anatomic locations, mainly due to space limitations within the head and neck region. Due to the use of smaller size needles, to a variety of small textile objects, and cavitary packing gauzes, surgeons and their teams need increased vigilance when operating in the head and neck region. In a review of over 150 malpractice claims related to tonsillectomies and adenoidectomies, three cases involved RSI, including one nasopharyngeal packing and one suture needle. In neurosurgery, retention of textile and various nonreabsorbable hemostatic materials has been reported. In one series, five textilomas prompted the performance of MRI studies to rule out the possibility of recurrent tumor. Authors of the same report suggest that unless RSIs are immediately detected, the most likely temporal marker at which detection occurs is within 6 months of the index surgery, or the time at which routine follow-up imaging is usually obtained and the acute inflammatory response may be heightened. In another case, a gossypiboma was found to be mimicking a recurrent intracranial tumor. Despite the rarity of these “never events,” the differential diagnosis in such circumstances should not exclude the possibility of an RSI, especially when a contrast-enhancing mass or an atypical lesion is present on advanced imaging following a tumor resection. Whenever surgical counts are incorrect or any other indication(s) exist to suggest the possibility of RSI, additional verification procedures using standard radiographs are appropriate. However, this may not be as helpful in neurosurgical (or head and neck) cases compared to other types of surgeries. Smaller instruments and needles that are routinely used in such cases can be very difficult to locate once misplaced. Moreover, a cadaveric study by Luo et al. showed that plain radiographs did not reliably detect small (e.g., ¼–½ inch) surgical sponges. This, in turn, emphasizes the importance of an accurate sponge counting and careful tracking of sponges during head and neck cases, and also stresses the need for CT imaging in cases where smaller sponges may have been left behind. A report on multicenter experience with intravascular RSIs described a variety of objects left behind including guide wires, catheters, catheter fragments, and coils. Unexpected procedural factors and equipment failures were significantly associated with increased risk of intravascular retained instruments. Of note, nearly 54% of cases were missed on initial postoperative imaging, highlighting the need for standardized communication, equipment and procedure training, as well as the establishment and enforcement of procedural safety systems.,, One unusual case of an intravascular RSI involved surgery for a lumbar spinal pseudarthrosis, during which the common iliac vein was inadvertently entered and profuse bleeding ensued, requiring hemostatic packing. Postoperatively the patient developed dyspnea and shortness of breath, and chest X-ray revealed radiopaque material around the left lobar artery, later confirmed on CT scan. Months later, the patient underwent a thoracotomy for persistent symptoms and removal of the intraarterial object (e.g., a cotton sponge with surrounding thrombus was retrieved). Embolization of intravascular retained items has also been reported by others. Despite the use of fewer instruments and smaller incisions, laparoscopic surgery is not immune from the problem of RSI, with a number of reported cases in this surgical patient population.,,, One general characteristic of RSIs associated with minimally invasive cases is that they are often “atypical” and may not be readily or intuitively identifiable.,, Operating room culture must change to prevent RSI in all types of surgical procedures, regardless of their invasiveness. This applies especially to laparoscopic and endoluminal surgery where it should theoretically be easier to keep track of instrument counts as fewer instruments are used during minimally invasive procedures., Yet, the false “sense of security” associated with laparoscopy can be used to justify potentially unsafe practices in the operating room (e.g., omitting surgical counts, poor checklist execution, taking shortcuts, etc.). Although RSIs should be regarded as “never events” in all patients, this is especially so in the pediatric population. Despite that, our knowledge of risks associated with RSIs is largely derived from the adult patient population,,, with available data from pediatric surgery remaining very scarce.,,, A 2009 study by Shah and Lander reported on 103 pediatric patients with RSI, demonstrating an overall incidence of 1 in 32,672 cases. The associated upcharge was approximately $42,000 per case. In 2015 Wang et al. reported that the incidence of RSI in children was approximately 2.2/100,000 admissions, with an average patient age of 8.3 years, an attributable length of stay of approximately 13 days, and associated total charges of around $91,000 per event. The World Health Organization's “Guidelines for Safe Surgery” implemented in 2008 have resulted in a decreased incidence of RSI in children in the USA. As with RSIs in the adult population, some cases of retained items in pediatric patients may not manifest clinically until years or even decades following the index operation., In one example, a malleable retractor was incidentally found in a 29-year-old male following abdominal radiography. The large (5 cm × 33 cm) object was left in place during a staging laparotomy for Hodgkin's lymphoma when the patient was only 15-year-old. Throughout the entire period of 14 years, the patient remained asymptomatic. While RSIs in body cavities are a major focus of patient safety initiatives, there are other types of items that can become unintentionally retained and have the potential to cause complications if unnoticed. Specific examples reported in pediatric patients include broken insulin infusion pump needles  and reusable lens introducers used to retain viscoelastic material in ophthalmologic surgery. In addition, children in the USA are becoming increasingly obese,, which may both increase the risk of RSI and make the diagnosis/detection more difficult.,, It is important to note that large institutions, children's hospitals, and teaching and public hospitals may have higher RSI rates than other health care organizations. However, this observation should be viewed with caution. For example, the role of trainee presence has not been shown to increase the risk of RSI in at least two reports., Although, in general, RSIs are very rare in the pediatric population, rates vary significantly between localities. While the number of factors that potentially contribute to the observed trends, rates, and outcomes is vast, one key parameter to scrutinize should be the degree of adherence to established “best practices” across different institutions and geographic locations. More research is warranted to better quantify the impact of RSI in pediatric surgical patients. Surgical objects that are unintentionally left in patients often to lead to civil lawsuits. Historically, individuals were accountable for such “never events.” However, more recently the legal system increasingly recognizes the culpability of “the system” as opposed to “the person” due to systemic complexities and the combination of human and team factors that usually lead to the occurrence of RSI [Table 2]., The average cost of RSI-related medicolegal expense ranges from $37,000 to $2,350,000 per incidence and does not always correspond to the degree of actual patient harm.,,, It has been shown that the length of intracorporeal retention of a surgical item correlates with inflammatory changes and symptoms. Consequently, prompt identification and removal of an RSI may be the best strategy to reduce associated morbidity and the risk of subsequent civil legal action. As always, an honest and apologetic admission to the patient that an error has been made is a critical component of rebuilding patient-surgeon trust and medicolegal risk containment. To further increase our current understanding of RSIs, their natural history, as well as various associated clinical findings, we performed an exhaustive literature search using PubMed and Google™ Scholar that identified a total of 281 reported cases of surgical object retention between 1909 and 2015. All available details regarding each reported case were abstracted, standardized, and tabulated into the following categories: (a) Demographics, (b) anatomic location of the retained object, (c) type of retained item, (d) time to identification/removal, (e) associated complications, (f) operation characteristics, and (g) pathology findings. The resulting dataset was previously published by our group. The methodology and rationale behind the performance of the current secondary analysis of reported cases and series is based on previously published guidance and consensus recommendations., Due to inherent shortcomings within the collected data, results are limited to descriptive statistics (means, medians, ranges, and frequencies). Types of RSI in this review series are shown in [Figure 4]. Surgical sponge was the most common RSI type, followed by other types of gauze, various plastic items/tubing, surgical instrument/retractor, needle, surgical suture material, or surgical specimen unintentionally left in place. 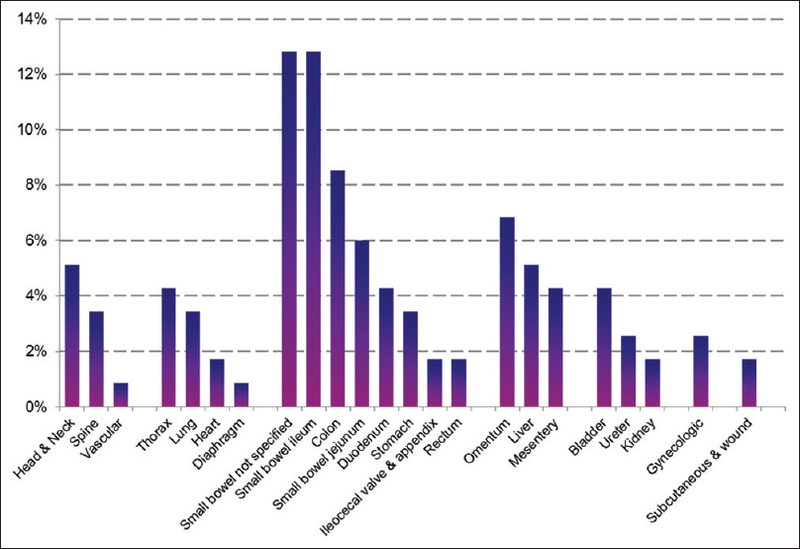 Again, consistent with the current analytical model's assumptions,, the general distribution of various item types approximates the overall RSI distribution reported in other major series.,, Diagnostically, the most commonly used modalities include CT (56% cases) and plain X-rays (43% cases), with other radiographic modalities being utilized less commonly [Figure 5]. A majority of RSIs in this series were recognized and removed within 2 years of index operation, with the remainder either remaining asymptomatic and being discovered incidentally at a later time, or becoming symptomatic after a longer period of dormancy. 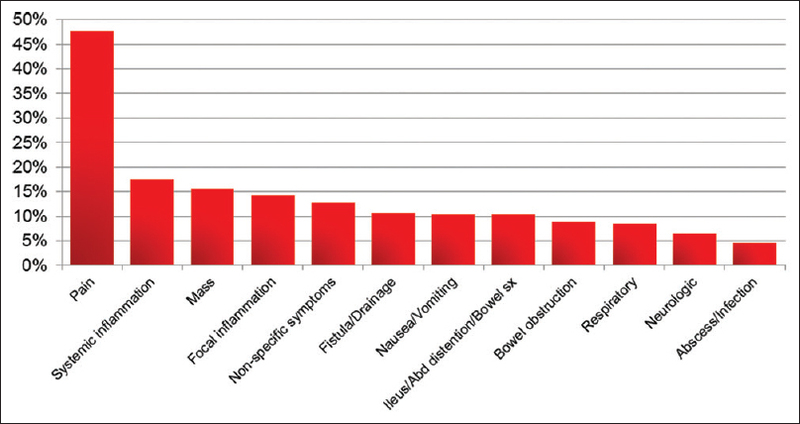 Symptoms associated with RSIs in the collected series are shown in [Figure 6]. Median time to retained item retrieval was 365 days [range, 0–16,790 days, 25–75% inter-quartile range of 60–1825 days, [Figure 7]. Only one previous report provides sufficient data reporting to ascertain temporal RSI retrieval patterns, albeit with a smaller sample size than the current review. In that report, median time to retrieval was 1 day, with a range anywhere from “immediate” retrieval to >3600 days postretention. Of note, patient population characteristics in the current collected review are different from those in the above-mentioned study of natural history of RSIs, with focus of the latter being on the shorter-term behavior of retained items. Further analysis of the current dataset  offers an important glimpse into the timing of RSI retrieval in relation to the location of the retained item. More specifically, median times to object retrieval, from shortest to longest were natural orifice/intraluminal (15 days), subcutaneous/soft tissue (121 days), spine/paraspinal (244 days), abdomen (377.5 days), thorax/mediastinum (455 days), head/neck (540 days), retroperitoneum (902.5 days), and extremity (3285 days). In terms of the presence and severity of symptoms (categorized by total number of symptoms present) associated with RSI, we noted a pattern of escalation associated with increasing duration of retention. More specifically, patients with no symptoms reported had a median duration of time to retrieval of only 75 days. For those with one reported symptom, the median duration was 365 days. Retrieval of retained item for patients with 2 reported symptoms was performed at the median temporal marker of 544 days following the index operation. Finally, for patients with 3 or more reported symptoms, the median time to retrieval was 570 days. These findings and trends are generally consistent with previous data showing that the longer the duration of retention, the more likely it is for symptoms to appear and/or worsen. 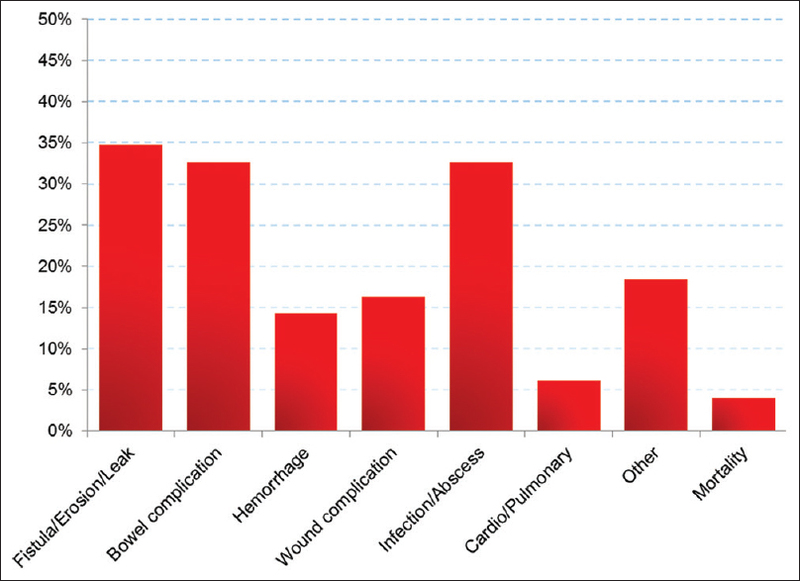 In the current series, surgical counts were mentioned in only 23 reports. Despite this limitation, potentially useful information was derived from our secondary analysis, with 13/23 (56.5%) surgical counts reported as being “correct.” This is generally consistent with previously reported data. Furthermore, safety procedures and compliance-related details in the collected RSI dataset  were reported in 18 cases, of which 17 were determined to have at least one safety variance. This is also in agreement with data reported by others., Of interest, published data suggest that over half of all RSI incidents involved more than one safety omission or variance, and majority of retained items were associated with system and/or team errors. Information on whether cases in the current collected review were emergent or elective was provided in 144 reports. Emergency surgery was performed in 33 of 144 cases (22.9%). This percentage is consistent with other published data (e.g., reported “emergency surgery” range of 13.3–37.3%).,, More than 1 subprocedure was performed in 24/144 reports (15.3%), with 24 reports (8%) describing 2 or more procedures. Again, these percentages are consistent with previously published data regarding the association between RSI and multiple procedures (16.7–49.2%)., In another study, an average of 2.8 subprocedures was performed in a sample of 30 surgeries complicated by RSI. In terms of gross specimen appearance and pathology data [Figure 9], this review found a heterogeneous collection of findings that approximates previous reports. Other than the general description of the retained item type, common findings included fibrosis, inflammation, tissue capsule formation, mass, and inflammatory changes [Figure 9]. It was previously reported that the chronicity of surgical item retention corresponds to the increase in “inflammation-related” findings on formal pathologic evaluation. Although the current review is not able to confirm such observation scientifically, it logically follows that the longer an object is retained, the more likely it is to cause an associated inflammatory and fibrotic response. RSIs are inherently associated with increased health care resource utilization. In the current review, median RSI-attributable hospital length of stay was 7 days (mean, 7.29 days; cumulative attributable length of stay, 481 days). In another study, readmissions were required in nearly 41% of RSI cases, with a second readmission needed in an additional 3% of cases. In that study, the median length of stay for readmissions was 3 days (range, 1–80 days). Detailed knowledge of risk factors associated with RSI is critical to effective preventive efforts. RSIs are associated with substantial patient harm, significant professional consequences to practitioners, as well as major legal and reputational sequelae to hospitals and health care systems. In addition to aggressive preventive measures, early detection and retrieval of RSIs may be associated with better clinical outcomes (e.g., fewer symptoms). Technological advances are increasingly utilized in an attempt to reduce the occurrence of RSIs. System-based prevention methods, including staff training and hard-wired safety procedures, must be implemented and embraced by all stakeholders to decrease the frequency of these and other “never events.” The ultimate goal in this domain is to develop system-based solutions and technological capabilities that go hand in hand with team training so that complete elimination of RSIs moves “from possibility to reality.” The accomplishment of this goal will require continued efforts of physicians, nurses, allied health care providers, scientists, engineers, and information technology specialists. Cumulatively, the findings of our review corroborate and highlight the need for a national RSI registry. Moffatt-Bruce SD, Ellison EC, Anderson HL 3rd, Chan L, Balija TM, Bernescu I, et al. Intravascular retained surgical items: A multicenter study of risk factors. J Surg Res 2012;178:519-23. Stawicki SP, Evans DC, Cipolla J, Seamon MJ, Lukaszczyk JJ, Prosciak MP, et al. Retained surgical foreign bodies: A comprehensive review of risks and preventive strategies. Scand J Surg 2009;98:8-17. AHRQ. Patient Safety Network – Never Events; 2014. Available from: http://www.psnet.ahrq.gov/primer.aspx?primerID=3. [Last accessed on 2015 Sep 10]. Stawicki SP, Galwankar SC, Papadimos TJ, Moffatt-Bruce SD. Fundamentals of Patient Safety in Medicine and Surgery. New Delhi, India: Wolters Kluwer Health Pvt. Ltd.; 2014. Hempel S, Maggard-Gibbons M, Nguyen DK, Dawes AJ, Miake-Lye I, Beroes JM, et al. Wrong-site surgery, retained surgical items, and surgical fires: A systematic review of surgical never events. JAMA Surg 2015;150:796-805. Stawicki SP, Cook CH, Anderson HL 3rd, Chowayou L, Cipolla J, Ahmed HM, et al. Natural history of retained surgical items supports the need for team training, early recognition, and prompt retrieval. Am J Surg 2014;208:65-72. Stawicki SP, Moffatt-Bruce SD, Ahmed HM, Anderson HL 3rd, Balija TM, Bernescu I, et al. Retained surgical items: A problem yet to be solved. J Am Coll Surg 2013;216:15-22. Wang CF, Cipolla J, Seamon MJ, Lindsey DE, Stawicki SP. Gastrointestinal complications related to retained surgical foreign bodies (RSFB): A concise review. OPUS 12 Scientist 2009;3:11-8. Mehtsun WT, Ibrahim AM, Diener-West M, Pronovost PJ, Makary MA. Surgical never events in the United States. Surgery 2013;153:465-72. Styskel B, Wernick B, Mubang RN, Stawicki SP. Retained Surgical Items: Collected Review of Cases and Case Series (1909-2015); 2015. Available from: https://www.researchgate.net/publication/284163003_Retained_Surgical_Items_Collected_Review_of_Cases_and_Case_Series_1909-2015. [Last accessed on 2015 Dec 20]. No_Thing_Left_Behind. NoThing Left Behind®: A National Surgical Patient-Safety Project to Prevent Retained Surgical Items; 2015. Available from: http://www.nothingleftbehind.org/. [Last accessed on 2015 Sep 10]. Steelman VM, Schaapveld AG, Perkhounkova Y, Storm HE, Mathias M. The hidden costs of reconciling surgical sponge counts. AORN J 2015;102:498-506. Stawicki SP, Seamon MJ, Martin ND, Cipolla J, Gracias VH, Lombardo G, et al. Retained surgical foreign bodies: A synopsis. OPUS 12 Scientist 2008;2:1-6. Gawande AA, Studdert DM, Orav EJ, Brennan TA, Zinner MJ. 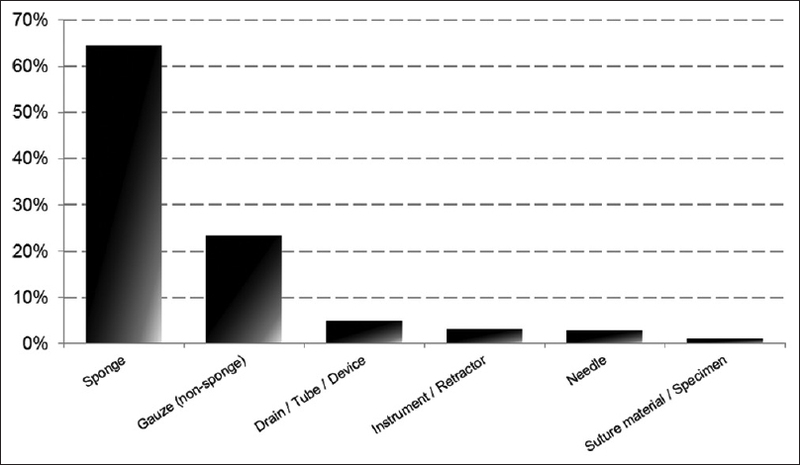 Risk factors for retained instruments and sponges after surgery. N Engl J Med 2003;348:229-35. Lincourt AE, Harrell A, Cristiano J, Sechrist C, Kercher K, Heniford BT. Retained foreign bodies after surgery. J Surg Res 2007;138:170-4. Ribalta T, McCutcheon IE, Neto AG, Gupta D, Kumar AJ, Biddle DA, et al. Textiloma (Gossypiboma) mimicking recurrent intracranial tumor. Arch Pathol Lab Med 2004;128:749-58. Kawamura Y, Ogasawara N, Yamamoto S, Sasaki M, Kawamura N, Izawa S, et al. Gossypiboma mimicking gastrointestinal stromal tumor causing intestinal obstruction: A case report. Case Rep Gastroenterol 2012;6:232-7. Turgut M, Akyüz O, Ozsunar Y, Kacar F. Sponge-induced granuloma (“Gauzoma”) as a complication of posterior lumbar surgery. Neurol Med Chir (Tokyo) 2005;45:209-11. Yoon MA, Kim E, Kwon BJ, Kim JE, Kang HS, Park JH, et al. Muslinoma and muslin-induced foreign body inflammatory reactions after surgical clipping and wrapping for intracranial aneurysms: Imaging findings and clinical features. J Neurosurg 2010;112:640-7. Charniot JC, Rama A, Leprince P, Isnard R, Vaissier E, Jault F, et al. Retrocardiac textiloma mimicking a left atrium myxoma. Circulation 2011;124:758-60. Kolettis PN, Butler BP, Ross JH. An unusual pelvic pseudotumor: A case report. J Urol 1996;155:644. Grieten M, Van Poppel H, Baert L, Baert AL, Oyen R. Renal pseudotumor due to a retained perirenal sponge: CT features. J Comput Assist Tomogr 1992;16:305-7. Deger RB, LiVolsi VA, Noumoff JS. Foreign body reaction (Gossypiboma) masking as recurrent ovarian cancer. Gynecol Oncol 1995;56:94-6. Mendez LE, Medina C. Late complication of laparoscopic salpingoophorectomy: Retained foreign body presenting as an acute abdomen. JSLS 1997;1:79-81. Silvestro C, Cocito L, Pisani R. Delayed effects of a migrated foreign body (Sewing needle) in the cervical spine: A case report. Spine (Phila Pa 1976) 2001;26:578-9. Smith CD. The retained surgical specimen, an unappreciated retained foreign object. J Laparoendosc Adv Surg Tech A 2011;21:737-9. National Quality Forum. Serious Reportable Events in Healthcare: A Consensus Report. Washington, DC: National Quality Forum; 2002. The_Joint_Commission. Sentinel Event Alert: Preventing Unintended Retained Foreign Objects; 2013. Available from: http://www.jointcommission.org/assets/1/6/sea_51_urfos_10_17_13_final.pdf. [Last accessed on 2016 Jan 02]. Akbulut S, Arikanoglu Z, Yagmur Y, Basbug M. Gossypibomas mimicking a splenic hydatid cyst and ileal tumor: A case report and literature review. J Gastrointest Surg 2011;15:2101-7. Moffatt-Bruce SD, Cook CH, Steinberg SM, Stawicki SP. Risk factors for retained surgical items: A meta-analysis and proposed risk stratification system. J Surg Res 2014;190:429-36. Judson TJ, Howell MD, Guglielmi C, Canacari E, Sands K. Miscount incidents: A novel approach to exploring risk factors for unintentionally retained surgical items. Jt Comm J Qual Patient Saf 2013;39:468-74. Egorova NN, Moskowitz A, Gelijns A, Weinberg A, Curty J, Rabin-Fastman B, et al. Managing the prevention of retained surgical instruments: What is the value of counting? Ann Surg 2008;247:13-8. Cima RR, Kollengode A, Garnatz J, Storsveen A, Weisbrod C, Deschamps C. Incidence and characteristics of potential and actual retained foreign object events in surgical patients. J Am Coll Surg 2008;207:80-7. Wan YL, Huang TJ, Huang DL, Lee TY, Tsai CC. Sonography and computed tomography of a gossypiboma and in vitro studies of sponges by ultrasound. Case report. Clin Imaging 1992;16:256-8. Sugimura H, Tamura S, Kakitsubata Y, Kakitsubata S, Uwada O, Kihara Y, et al. Magnetic resonance imaging of retained surgical sponges. Case report. Clin Imaging 1992;16:259-62. Mochizuki T, Takehara Y, Ichijo K, Nishimura T, Takahashi M, Kaneko M. Case report: MR appearance of a retained surgical sponge. Clin Radiol 1992;46:66-7. O'Connor AR, Coakley FV, Meng MV, Eberhardt SC. Imaging of retained surgical sponges in the abdomen and pelvis. AJR Am J Roentgenol 2003;180:481-9. Yorke J, Agbeko E, Amoah G, Abantanga FA. Intestinal obstruction secondary to an intra-abdominal foreign body. J Med Biomed Sci 2013;2:1-5. Rodrigues D, Perez NE, Hammer PM, Webber JD. Laparoscopic removal of a retained intra-abdominal ribbon malleable retractor after 14 years. J Laparoendosc Adv Surg Tech A 2006;16:369-71. Walter WR, Amis ES Jr., Sprayregen S, Haramati LB. Intraoperative radiography for evaluation of surgical miscounts. J Am Coll Radiol 2015;12:824-9. Kul S, Günes G. Gossypiboma of the breast: Imaging findings. J Radiol Case Rep 2010;4:21-5. Burrel M, Capurro S, Arguis P, Vilana R. Sonographic appearance of a retained surgical sponge in the neck. J Clin Ultrasound 2000;28:311-3. Zbar AP, Agrawal A, Saeed IT, Utidjian MR. Gossypiboma revisited: A case report and review of the literature. J R Coll Surg Edinb 1998;43:417-8. Arnold AC, Sodickson A. Postoperative surgicel mimicking abscesses following cholecystectomy and liver biopsy. Emerg Radiol 2008;15:183-5. Rajalingam R, Saluja SS, Sharma A, Mishra PK. Post cholecystectomy gossypiboma: A malignant masquerade. Am Surg 2011;77:E94-5. Kim CK, Park BK, Ha H. Gossypiboma in abdomen and pelvis: MRI findings in four patients. AJR Am J Roentgenol 2007;189:814-7. Moiyadi AV, Pai P, Chaturvedi P, D'Cruz A. Intracranial gossypiboma: An under-reported entity. Neurol India 2010;58:492-3. Dempsey MF, Condon B. Thermal injuries associated with MRI. Clin Radiol 2001;56:457-65. García de Llanos C, Cabrera Navarro P, Freixinet Gilart J, Rodríguez Suárez P, Hussein Serhald M, Romero Saavedra T. Intrathoracic gossypiboma interpreted as bronchogenic carcinoma. Another false positive with positron emission tomography. Arch Bronconeumol 2007;43:292-4. Miyake KK, Nakamoto Y, Mikami Y, Ishizu K, Saga T, Higashi T, et al. F-18 FDG PET of foreign body granuloma: Pathologic correlation with imaging features in 3 cases. Clin Nucl Med 2010;35:853-7. Coleman J, Wolfgang CL. Necessity of a good surgical history: Detection of a gossypiboma. J Nurse Pract 2013;9:277-82. Yildirim T, Parlakgumus A, Yildirim S. Diagnosis and management of retained foreign objects. J Coll Physicians Surg Pak 2015;25:367-71. Toubia T, Sangha R. Retained vaginal foreign body in minimally invasive gynecological surgeries. CRSLS 2013;e2014, 240. Applegate KE, Dardinger JT, Lieber ML, Herts BR, Davros WJ, Obuchowski NA, et al. Spiral CT scanning technique in the detection of aspiration of LEGO foreign bodies. Pediatr Radiol 2001;31:836-40. Ojha S, Gall T, Sodergren MH, Jiao LR. A case of gossypiboma mimicking intrahepatic cholangiocarcinoma. Ann R Coll Surg Engl 2014;96:e14-6. Mir R, Singh VP. Retained intra-thoracic surgical pack mimicking as recurrent aspergilloma. J Clin Diagn Res 2012;6:1775-7. Miguélez Vara C, Mariñan Gorospe M. Resected asymptomatic intrathoracic textiloma 37 years after thoracotomy. Arch Bronconeumol 2010;46:492-3. Granetzny A, Holtbecker N, Thomas H, Klein K, Boseila A. Misinterpretation of a pulmonary GI anastomosis stapler line as a retained foreign body. Chest 2008;133:281-3. Dossett LA, Dittus RS, Speroff T, May AK, Cotton BA. Cost-effectiveness of routine radiographs after emergent open cavity operations. Surgery 2008;144:317-21. Porter KK, Bailey PD, Woods R, Scott WW Jr., Johnson PT. Retained surgical item identification on imaging studies: A training module for radiology residents. Int J Comput Assist Radiol Surg 2015;10:1803-9. Goldberg JL, Feldman DL. Implementing AORN recommended practices for prevention of retained surgical items. AORN J 2012;95:205-16. Stawicki SP, Galwankar SC, Papadimos TJ, Moffatt-Bruce SD. Fundamentals of Patient Safety in Medicine and Surgery. New Delhi: Wolters Kluwer Health (India) Pvt. Ltd.; 2014. Macario A, Morris D, Morris S. Initial clinical evaluation of a handheld device for detecting retained surgical gauze sponges using radiofrequency identification technology. Arch Surg 2006;141:659-62. Steelman VM, Alasagheirin MH. Assessment of radiofrequency device sensitivity for the detection of retained surgical sponges in patients with morbid obesity. Arch Surg 2012;147:955-60. Sakorafas GH, Sampanis D, Lappas C, Papantoni E, Christodoulou S, Mastoraki A, et al. Retained surgical sponges: What the practicing clinician should know. Langenbecks Arch Surg 2010;395:1001-7. Smith EA, Akusoba I, Sabol DM, Stawicki SP, Granson MA, Ellison EC, et al. Surgical safety checklist: Productive, nondisruptive, and the “right thing to do”. J Postgrad Med 2015;61:214-5.
de Vries EN, Eikens-Jansen MP, Hamersma AM, Smorenburg SM, Gouma DJ, Boermeester MA. Prevention of surgical malpractice claims by use of a surgical safety checklist. Ann Surg 2011;253:624-8. Nilsson L, Lindberget O, Gupta A, Vegfors M. Implementing a pre-operative checklist to increase patient safety: A 1-year follow-up of personnel attitudes. Acta Anaesthesiol Scand 2010;54:176-82. Kleinpeter MA. Standardizing ambulatory care procedures in a public hospital system to improve patient safety. In: Henriksen K, Battles JB, Marks ES, Lewin DI, Editors. Advances in Patient Safety: From Research to Implementation (Volume 4: Programs, Tools, and Products). Rockville (MD): AHRQ; 2005. Wolf FA, Way LW, Stewart L. The efficacy of medical team training: Improved team performance and decreased operating room delays: A detailed analysis of 4863 cases. Ann Surg 2010;252:477-83. Rogers A, Jones E, Oleynikov D. Radio frequency identification (RFID) applied to surgical sponges. Surg Endosc 2007;21:1235-7. Stynes T. Medtronic to Acquire RF Surgical for $235 Million; 2015. Available from: http://www.wsj.com/articles/medtronic-to-acquire-rf-surgical-for-235-million-1436793197. [Last accessed on 2015 Sep 23]. Walker J. Stryker to Pay $210 Million for Maker of Bar-Coded Sponges; 2013. Available from: http://www.wsj.com/articles/SB10001424052702303453004579292543294867438. [Last accessed on 2015 Sep 23]. Regenbogen SE, Greenberg CC, Resch SC, Kollengode A, Cima RR, Zinner MJ, et al. Prevention of retained surgical sponges: A decision-analytic model predicting relative cost-effectiveness. Surgery 2009;145:527-35. Madhusudhan KS, Madan R, Shad PS. Gossypiboma causing intestinal obstruction. Clin Res Hepatol Gastroenterol 2012;36:400-1. Alayo E, Attar B, Go B. Image of the month. A case of recurrent abdominal pain due to a gossypiboma with spontaneous resolution. Clin Gastroenterol Hepatol 2010;8:e13-4. Popoola AA, Bello JO, Ezeoke GG, Adeshina KT, Fadimu A. Concealed enterovesical fistula associated with forgotten intra-abdominal haemostat and intravesical towel. Case Rep Urol 2014;2014:723592. Kumar B, Kumar P, Sinha SK, Sinha N, Hasan Z, Thakur VK, et al. Gossypiboma mimicking posterior urethral stricture. Int J Surg Case Rep 2013;4:425-8. Stawicki SP, Cipolla J, Bria C. Comparison of open abdomens in non-trauma and trauma patients: A retrospective study. OPUS 12 Scientist 2007;1:1-8. Smith BP, Adams RC, Doraiswamy VA, Nagaraja V, Seamon MJ, Wisler J, et al. Review of abdominal damage control and open abdomens: Focus on gastrointestinal complications. J Gastrointestin Liver Dis 2010;19:425-35. Teixeira PG, Inaba K, Salim A, Brown C, Rhee P, Browder T, et al. Retained foreign bodies after emergent trauma surgery: Incidence after 2526 cavitary explorations. Am Surg 2007;73:1031-4. Shaish H, Gilet A, Gerard P. 'It's all foreign to me': How to decipher gastrointestinal intraluminal foreign bodies. Abdom Imaging 2015;40:2173-92. Scott WW, Beall DP, Wheeler PS. The retained intrapericardial sponge: Value of the lateral chest radiograph. AJR Am J Roentgenol 1998;171:595-7. Coskun M, Boyvat F, Agildere AM. CT features of a pericardial gossypiboma. Eur Radiol 1999;9:728-30. Erol C, Koplay M, Paksoy Y, Kanat F. Case series: Pericardial gossypibomas detected after cardiovascular surgery: Imaging findings. Indian J Radiol Imaging 2012;22:276-8. Karabulut N, Herek D, Kiroglu Y. CT features of intrathoracic gossypiboma (textiloma). Diagn Interv Radiol 2011;17:122-4. Suwatanapongched T, Boonkasem S, Sathianpitayakul E, Leelachaikul P. Intrathoracic gossypiboma: Radiographic and CT findings. Br J Radiol 2005 78:933, 851-853. Koul PA, Mufti SA, Khan UH, Jan RA. Intrathoracic gossypiboma causing intractable cough. Interact Cardiovasc Thorac Surg 2012;14:228-30. Szarf G, Mussi de Andrade TC, Nakano E, Szjenfeld D, Costa AS Jr., Rymkiewicz E, et al. Forty-year-old intrathoracic gossypiboma after cardiac valve surgery. Circulation 2009;119:3142-3. Sheehan RE, Sheppard MN, Hansell DM. Retained intrathoracic surgical swab: CT appearances. J Thorac Imaging 2000;15:61-4. Rodríguez P, Romero T, Rodríguez de Castro F, Hussein M, Freixinet J. Bronchogenic carcinoma associated with rheumatoid arthritis: Role of FDG-PET scans. Rheumatology (Oxford) 2006;45:359-60. Madan R, Trotman-Dickenson B, Hunsaker AR. Intrathoracic gossypiboma. AJR Am J Roentgenol 2007;189:W90-1. AORN. Recommended Practices for Prevention of Retained Surgical Items; 2012. Available from: http://www. 1.ucirvinehealth.org/magnetnursing/clienthtml/69/attachments-and-reference-documents/118/SE2EOa.pdf. [Last accessed on 2016 Jan 08]. Gibbs VC. Retained surgical items. In: Patient Safety. Heidelberg: Springer; 2014. p. 129-43. Yeniceri O, Balci P, Cullu N, Deveer M. Gossipyboma in the breast: A rare case report. J Med Cases 2014;5:140-2. Kouwenberg IC, Frölke JP. Progressive ossification due to retained surgical sponge after upper leg amputation: A case report. Cases J 2009;2:8592. Vira S, Ramme A, Shakked R, McLaurin TM, Tejwani NC. Two cases of retained cement after hip hemiarthroplasty don't forget the basics. Bull Hosp Jt Dis 2015;73:286-8. Lo CP, Hsu CC, Chang TH. Gossypiboma of the leg: MR imaging characteristics. A case report. Korean J Radiol 2003;4:191-3. Perigela HC, Reddy K, Bangi VP, Janjala N. Foreign body granuloma mimicking a soft-tissue tumor. J Dr NTR Univ Health Sci 2014;3:143. Choi BI, Kim SH, Yu ES, Chung HS, Han MC, Kim CW. Retained surgical sponge: Diagnosis with CT and sonography. AJR Am J Roentgenol 1988;150:1047-50. Kuwashima S, Yamato M, Fujioka M, Ishibashi M, Kogure H, Tajima Y. MR findings of surgically retained sponges and towels: Report of two cases. Radiat Med 1993;11:98-101. Thompson M, Wright S, Cheng LH, Starr D. Locating broken dental needles. Int J Oral Maxillofac Surg 2003;32:642-4. Marquardt G, Rettig J, Lang J, Seifert V. Retained surgical sponges, a denied neurosurgical reality? Cautionary note. Neurosurg Rev 2001;24:41-3. Muñoz A, Villafruela M. MR imaging recognition of nasopharyngeal gauze retention in a child. Pediatr Radiol 2000;30:811-2. Simonsen AR, Duncavage JA, Becker SS. A review of malpractice cases after tonsillectomy and adenoidectomy. Int J Pediatr Otorhinolaryngol 2010;74:977-9. Wafer G, Gramicidin S, Grifulvin V. Textiloma (Gossypiboma) mimicking recurrent intracranial tumor. Arch Pathol Lab Med 2004;128:749-58. Luo WT, Almack R, Mawson JB, Cochrane DD. Radiographic detectability of retained neuropatties in a cadaver model. World Neurosurg 2015;84:405-11. Kester NL, Hassien JD. Pulmonary embolism caused by a surgical sponge. AJR Am J Roentgenol 1992;158:757-9. Hugh TB, Colman JV. Laparoscopic intraperitoneal foreign body from adhesive drapes. Aust N Z J Surg 2000;70:525. Gibbs VC. Retained surgical items and minimally invasive surgery. World J Surg 2011;35:1532-9. Koontz CS, Smith LA, Burkholder HC, Higdon K, Aderhold R, Carr M. Video-assisted transumbilical appendectomy in children. J Pediatr Surg 2006;41:710-2. Howard FM. Breaking new ground or just digging a hole? An evaluation of gynecologic operative laparoscopy. J Gynecol Surg 1992;8:143-58. Norton EK, Martin C, Micheli AJ. Patients count on it: An initiative to reduce incorrect counts and prevent retained surgical items. AORN J 2012;95:109-21. Uranus S, Schauer C, Pfeifer J, Dagcioglu A. Laparoscopic removal of a large laparotomy pad forgotten in situ. Surg Laparosc Endosc Percutan Tech 1995;5:77-9. Moppett IK, Moppett SH. Surgical caseload and the risk of surgical never events in England. Anaesthesia 2016;71:17-30. Wang B, Tashiro J, Perez EA, Lasko DS, Sola JE. Hospital and procedure incidence of pediatric retained surgical items. J Surg Res 2015;198:400-5. Shah RK, Lander L. Retained foreign bodies during surgery in pediatric patients: A national perspective. J Pediatr Surg 2009;44:738-42.
WHO. Guidelines for Safe Surgery; 2015. Available from: http://www.apps.who.int/iris/bitstream/10665/44185/1/9789241598552_eng.pdf. [Last accessed on 2016 Jan 26]. Parelkar SV, Sanghvi BV, Shetty SR, Athawale H, Oak SN. Needle in a haystack: Intraoperative breakage of pediatric minimal access surgery instruments. J Postgrad Med 2014;60:324-6. Macilquham MD, Riley RG, Grossberg P. Identifying lost surgical needles using radiographic techniques. AORN J 2003;78:73-8. Plager P, Murati MA, Moran A, Sunni M. Two case reports of retained steel insulin pump infusion set needles. Pediatr Diabetes 2016;17:160-3. Abdulkarim H, Rogers NK, Salvi SM. Instrument debris-related fibrinous uveitis after pediatric cataract surgery. Indian J Ophthalmol 2013;61:83-4. Dietz WH. The response of the US centers for disease control and prevention to the obesity epidemic. Annu Rev Public Health 2015;36:575-96. Lefevre FV, Waters TM, Budetti PP. A survey of physician training programs in risk management and communication skills for malpractice prevention. J Law Med Ethics 2000;28:258-66. Gibbs VC, Coakley FD, Reines HD. Preventable errors in the operating room: Retained foreign bodies after surgery – Part I. Curr Probl Surg 2007;44:281-337. Mello MM, Studdert DM. The O'Neill institute for national and global health law: Health care financing and organization: Deconstructing negligence: The role of individual and system factors in causing medical injuries. Georgetown Law J 2008;96:599-2143. Dippolito A, Braslow BM, Lombardo G, Hoddinott KM, Nace G, Stawicki SP. How david beat goliath: History of physicians fighting frivolous lawsuits. OPUS 12 Scientist 2008;2:1-8. NQF. Serious Reportable Events in Healthcare-2006 Update. Washington, D.C.: NQF; 2007. Available from: http://www.qualityforum.org/Publications/2007/03/Serious_Reportable_Events_in_Healthcare%E2%80%932006_Update.aspx. [Last accessed on 2015 Sep 24]. Wachter RM, Foster NE, Dudley RA. Medicare's decision to withhold payment for hospital errors: The devil is in the det. Jt Comm J Qual Patient Saf 2008;34:116-23. Greenberg CC, Diaz-Flores R, Lipsitz SR, Regenbogen SE, Mulholland L, Mearn F, et al. Bar-coding surgical sponges to improve safety: A randomized controlled trial. Ann Surg 2008;247:612-6. Pairolero PC. Quality, safety, and transparency: A rising tide floats all boats. Ann Thorac Surg 2005;80:387-95. Gibbs VC. Patient safety practices in the operating room: Correct-site surgery and nothing left behind. Surg Clin North Am 2005;85:1307-19, xiii. Association of periOperative Registered Nurses. AORN guidance statement: Creating a patient safety culture. AORN J 2006;83:936-42. Beyea SC. Counting instruments and sponges. AORN J 2003;78:290, 293-4. Michaels RK, Makary MA, Dahab Y, Frassica FJ, Heitmiller E, Rowen LC, et al. Achieving the national quality forum's “never events”: Prevention of wrong site, wrong procedure, and wrong patient operations. Ann Surg 2007;245:526-32. Zahiri HR, Stromberg J, Skupsky H, Knepp EK, Folstein M, Silverman R, et al. Prevention of 3 “never events” in the operating room: Fires, gossypiboma, and wrong-site surgery. Surg Innov 2011;18:55-60. Edmondson AC. Speaking up in the operating room: How team leaders promote learning in interdisciplinary action teams. J Manage Stud 2003;40:1419-52. Smith C. Surgical Tools Left in Five Patients; 2001. Available from: http://www.seattlepi.com/local/article/Surgical-tools-left-in-five-patients-1074029.php. [Last accessed on 2015 Sep 24]. National Practitioner Data Bank: Public Use Data File; 2015. Available from: . [Last updated on 2015 Aug 15; Last accessed on 2015 Sep 24]. Stawicki SP, Linden A, Werthmann P, Gunter O, Lindsey DE, Bashir AHH. Large Collection of Disease-Specific Case Reports Versus the Population. Do They Approximate Each Other? 2015. Available from: . [Last accessed on 2016 Jan 19]. Bhoot N, Shah A, Gumbs M, Stawicki SP. Collected Case Reports Versus Collected Case Series: Are They Equivalent? 2007. Available from: . [Last accessed on 2016 Jan 19].